ACME II experiment at Harvard reports a new upper limit for the electron EDM (electric dipole moment). The previous upper limit was . According to SM (Standard Model) of particle physics electron is a point particle with no spatial extension. Therefore, the electron EDM should be very close to zero. But, quantum effects (sea of virtual particles flickering around the electron core) can cause an asymmetric electric charge distribution therefore nonzero electric dipole moment. The SM estimate for EDM is less than . BSM (beyond SM) models such as the models involving supersymmetry predict higher EDM. The latest EDM measurements indicate that there is no hope of discovering supersymmetry with the current CERN LHC experiments. The ACME collaboration is financially supported by NSF (National Science Foundation). The NSF news release about the latest EDM measurements is the best place to start reading about this subject. As an aside, it is said that EDM breaks the P-symmetry as well as the T-symmetry. I wanted to understand this. Unfortunately, I could not find a satisfactory tutorial on the web. Here’s my amateurish attempt for explanation. Parity inversion (P) switches the sign of all spatial coordinates (i.e. , , ); time reversal (T) inverts the sign of all quantities associated with time ( ) or motion, such as momentum ; charge conjugation (C) reverses electric charge ( ). All the laws of classical physics are identical under these mathematical operations. 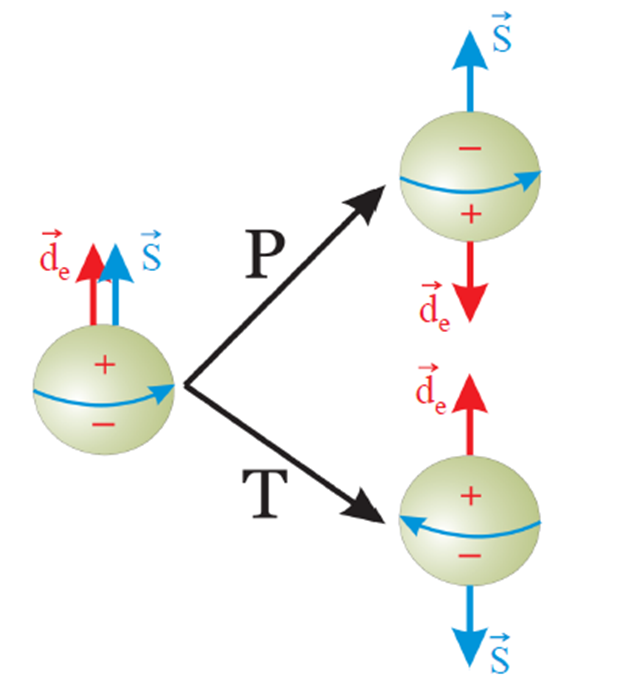 Quantum processes involving the “weak-nuclear force”, however, can violate P, T or CP minimally. The CPT invariance is believed to be exact in both classical and quantum processes. This also means that T-symmetry is equivalent to CP-symmetry. Another direct consequence, of course, is that when the T-symmetry is broken the CP-symmetry would be broken as well; and vica versa. Since T-symmetry is equivalent to CP-symmetry, applying the T transformation to an electron turns it into a positron (anti-electron). The C transformation changes charge, P transformation changes helicity. This is how electron becomes a positron under the CP transformation. What is the “symmetry” here? Electrons and positrons follow the same laws of physics. That’s the symmetry. Let’s assume that initially the spin vector (MDM) and the dipole vector (EDM) are pointing in the same direction. P transformation: P changes dipole direction but remember P also changes helicity. This means that MDM and EDM vectors will be pointing in opposite directions after the P transformation. T transformation = C transformation followed by P transformation: if there is a non-zero EDM it would flip after C but P would flip it again. P also changes helicity therefore MDM and EDM vectors would be pointing in opposite directions. In both scenarios the EDM and MDM vectors would be pointing in opposite directions after P or T transformations. Such electrons/positrons would not behave the same. This means that a non-zero EDM would break P-symmetry as well as the T-symmetry. Dave DeMille (Yale University) who is a member of the ACME II collaboration has a nice tutorial on electron EDM. I wrote about the electron EDM in 2014 when the ACME experiment reported their previous upper limit on electron EDM in this blogpost. This entry was posted in physics and tagged ACME II, EDM. Bookmark the permalink.